'Manh cong' cake is an ancient Hanoi dessert that embodies the ancient tastes and also the spiritual values of Vietnam’s capital city. Manh cong' is a kind of Herbaceous plant, which can be found growing wild in forests, wet fields, and village ponds. Manh cong leaves, a source of calcium, are not only tasty but also good for human bones, especially important for children and the elderly. In the past, manh cong leaves were served as a vegetable or used to treat small open wounds. Hanoians, with their skillful hands, exploited this wild herb in colorful cakes combining the fragrance of manh cong leaves and glutinous rice. To make the cake, manh cong leaves are ground until smooth to extract their juices, which have a special aroma that other leaves can’t match. The extract is then mixed with glutinous rice flour and sugar before cooking over low heat. Remember to whisk constantly until the dough just comes to a boil, then let cool to room temperature. For the filling, blend green beans with shredded coconut and sugar. When the ingredients are ready, wrap the cake in banana leaves and steam about 10 minutes before serving. When it’s steamed, the dark green dough turns translucent, so the filling will be highlighted and eye-catching. 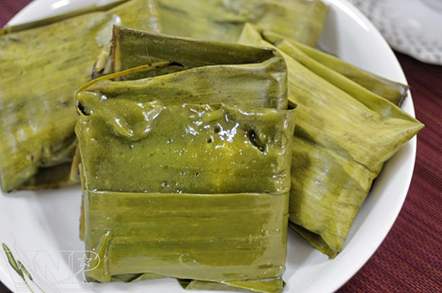 The cake, with its fresh green color, sweet aroma of glutinous rice, and fragrance of green beans melts your heart from the first bite.